The following are my notes taken on 12 January 2012 while watching the UIE Virtual Seminar “Buttons are a Hack” presented by Josh Clark (@globalmoxie). These notes are very raw even though some additional phrasing and context have been applied to such below. Using Mice and Pointers are prosthetics that have helped us interact with a computer. As screen sizes increase, traditional controls feel cramped in large touch screens since their relative positions traditionally do not scale. (Responsive design can sometimes address this issue but not always and shouldn’t be considered the only way). Fitts’s Law may apply greater to touch screens due to the grander of gesture over that of just a mouse. Pinball Machines are button-based mechanical devices – how would it be without the use of buttons? Answer – if a pinball’s glass is removed, grabbing a ball and attempting to throw/roll it towards the target becomes the primary action (know from person experience while growing up). How can we more effectively use visual shortcuts and hints? “Big Screens require Big Gestures” – both in natural action and in possibilities. Buttons originated in mechanical, clockwork devices – thinking of a webpage as a clockwork automation can lead to some additional interesting metaphors. Random Though: How could a list or card stack design be adjusted to be more fluid and touch focused? Due to its size, the iPad is more prone to dominant hand issues where as the iPhone has less of an issue. Always review a device’s specific User Interface Guidelines when creating apps for platforms. Still reference such for websites that specifically target those devices to be aware of possible expectations and clashes. Responsive and Adaptive web design is not always the best option for all forms of content. There is no true silver bullet for web design and user testing needs to be considered. Even though people love to do text messaging, doesn’t mean they enjoy going from form field to form field. Random Thought: Wonder how many people use the “Previous/Next” buttons on iOS keyboards when typing in a form. Don’t use up front instructions, no one reads them. iOS5 Contacts and Calendar use a book metaphor and don’t allow page turning. Be careful when mixing design metaphors as the interfaces become more natural. Toddlers are great examples of beta testing touch and natural user interfaces since they don’t have to unlearn years of point and click. They also learn and try different interactions to get things to work. If you coach/guide someone into a gesture – hide the tip after the first or second time to ensure it doesn’t turn into noise. Tip: If something scrolls off screen, animate it scrolling into the default position to help subtly show that it scrolls to the user. Don’t be afraid to explore extremes – Uzu (iPad app) has functions for up to 10 finger gestures! This past weekend, I had the privilege of attending the 8th semi-annual Iowa Code Camp. During my time up there, I presented a design workshop. The workshop was the first presented at any Iowa Code Camp and was attended with by a handful of individuals. While it was a fairly experimental endeavor, all attendees enjoyed it due to the interactivity and the exposure to elements of the design process that usually came well before their work on a project. In terms of how I facilitated the workshop, I assisted in guiding the attendees through the following tasks. This presentation was a quick introduction to the exercises that is typical in most workshops. Having attended Iowa Code Camp multiple times in the past, I made sure to provide as much information as I could since the majority of attendees are developers and not designers. After the presentation, I divided the room into a couple of teams. Once the teams were established, I handed each one of two design scenarios that every attendee could related to. The first scenario was to redesign the conference’s website. The second scenario is a redesign of a fictional job site. The first true exercise was in brainstorming certain things with relation to each scenario. Each team was asked to brainstorm 5 audience segments for their scenario first. I wanted to challenge the teams to think beyond the obvious audiences. Similarly, I next asked them to explore and brainstorm at least 5 different contexts in which one or more audience segment may access the site. There was a little confusion on this one since I didn’t thoroughly explain what I meant by the when and how as the definition of context. One example of what I was looking for would the fact that participants of an event would want different information at the event than they would prior to attending at all. After contexts were identified, I next asked each team to brainstorm a number of features that’d be on the site. This represented the business assumptions of what their customers would want. Lastly, I asked each team to try and brainstorm a moderate amount of possible content elements that’d appear on the site (i.e. A speaker’s bio, a job’s description, etc.). From observations, coming up with ~25 pieces of content was one of the hardest parts of the workshop for both teams. As I refactor the workshop, I plan to dedicate a lot of time towards this topic. This exercise entailed creating 5-6 talking points or goals in order to get information on while conducting an open-ended interview with a member of the other team, who was role playing a representative of an audience segment. The goal was to simulate a customer interview in a fashion outlined by Indi Young’s Mental Model process. The conversations went fairly well; however, most of the talking points turned into direct questions. While I feel like it was a good exercise, I am definitely reevaluating it in future versions of the workshop. Next, I had each team use the content in which they brainstormed in order to do a card sorting exercise. This exercise went well in illustrating the differences in how people sort, label, and justify the placement of the content on the site. Each team sorted their cards themselves and made a mental note of their own labels and sorting. After each team had finished, each team sorted the other’s deck while the other team observed. While card sorting can gain a large amount of benefits when done multiple times to identify trends, even this small sample set of a sort showed everyone the impact it could have. Sadly, time ran short and we weren’t able to really do any form of prototyping beyond a quick sketching exercise. Had I more time, each person of each team would pick a page of their site and spend 3-5 minutes sketching (quickly) 6 small screen representations of that page. With a short time limit, ideas are raw. After the time expired, each team would review the ideas each time and identify the top 2 ideas. Normally, this discussion could take significantly longer; however, it was very brief in the workshop sadly. After the ideas are agreed upon, 3-5 minutes would be spent sketching those 2 ideas in a bit larger detail. Again, discussion would follow until the 1 idea rises from the last round of sketches. Finally, one last round of sketches is done in order to sketch the 1 agreed upon idea; followed by a final discussion. Depending on additional changes I make earlier in the workshop’s agenda, I may cut Prototyping completely. Prototyping is an exercise that could easily fill multiple hours and I’ve attended a couple such workshops myself. Being able to work through an idea from concept to a presentable model is definitely a fun exercise. Yesterday, Amazon unveiled the updates to the Kindle product line and held within were a few surprises. One of the largest surprise that I took away was that Amazon created their own Webkit based browser called Amazon Silk for use on the new Amazon Kindle Fire. As I watched the introductory video, I couldn’t help but focus on the concept of the smart computing cloud of EC2 to pre-cache trending pages/links so the speeds associated with these pages are faster. While the concept isn’t new, it’s something that many people struggle with in achieving. Thankfully, the tools are available to replicate the goal of increasing the speed of rendering without the need of EC2. Before we can begin to reliably cache targeted pages, we need to know what pages to cache. This can easily be done using typical search analytic packages such as Google Analytics. Inside of these packages (Google Analytics will be used as the example), you should be able to locate your top content on the site. This represents the pages with the most visits over a period of time. If you use a proxy server to cache the content of your website instead of directly hitting the web server, these are the pages you should be making sure are cached appropriately. The next thing to pay attention to on this list is how users are getting to these pages and where they are going from such. If the links are internal, this opens up the possibility of prefetch caching the “next” page onto the client’s system. Obviously not all things can be cached like this (e.g. steps with in a shopping cart); however, if the users typically click on the “Login” link from your homepage, prefetching this link may provide a better, faster experience. 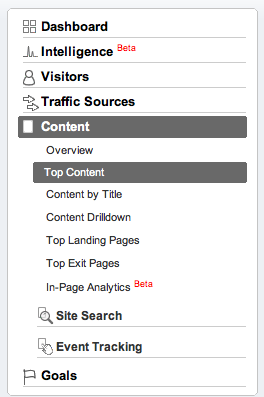 The last item to focus on in the analytics tool is any form of search analytics you may have. I’m not talking about SEO analytics but more about internal site searches for when the user just cannot locate the information in the various navigation structure(s) you’ve presented. If there tends to be a search term used very frequently, this is a possible candidate for caching as well as the page most people click on from search terms. While such information tends to shine a spotlight on where your navigation may need to adjust; caching the content in anticipation may be a helpful short term solution. For more information on this type of analysis of your internal search analytics, I highly recommend Louis Rosenfeld’s book Search Analytics for Your Site. Assuming you don’t have the ability to setup a proxy server between the web server content and the consuming browser, there are ways to cache the content of your site for the consumers to interact with. The primary one I want to focus on is the new HTML5 prefetch method. In the proxy server case, the browser requests the information from a proxy server. The server checks to see if it already has that information from a previous request, and send the information to the consumer if it does. While the information may be stale, most content on the web is capable of being cached like this without any impact. With HTML5 prefetch caching, the cached content is stored on the consuming browser’s device along with typical internet cache or temp files. How this is different than normal browsing is that prefetch can request a page, image, or other resource while the user is on a different page. If you have ever went to a web page, left, and then went back to it; the return experience should be a lot faster for you. This is using the local cache of the page. In order to enable Html5 prefetch caching, you simply need to add the following line into the <head> tag of the page. This single line tells the browser to retrieve the specified file while the user is on the current page. These lines can be dynamically added to the head tag in order to adapt to trends or to address the needs of search term results, as well. If you want to learn more about HTML5 prefetching, checkout this blog post by Jean-Baptiste Jung. While browsers are getting faster, it is nice to be able to ensure the user experiences the speed of the page they request. While prefetch caching isn’t identical to all of the optimizations that EC2 does for Amazon Silk, it does provide an alternative in terms of the perceived experience. Review the needs of your audience through the analytical data available and act accordingly. Caching is just one of many solutions but can provide a great value to your users.